The updated version of Canada’s Food Guide incorporates a section pertaining to healthy eating habits, listing “involve others in planning and preparing meals” and “eat meals with others” as behaviours to integrate into your diet. Benefits of such communal experiences include learning new skills, implementing healthy foods, and spending quality time together. Released on January 28, the updates to the guide come after a Canadian Press article tells the story of Flo Elliot, an elderly woman who lost her appetite after her husband passed away. However, the association between loneliness and poor nutrition is not an uncommon finding. Social context and other individuals are influential to our eating habits. Evidence of this is reflected in our altered family relationships. Due to location differences, increased screen time, variable schedules, and other external factors, families find themselves not spending enough time eating together. “Over the last several generations, we’ve seen [that] family units are not as tight knitted as they used to be,” said Dr. Carol Greenwood, Professor Emeritus of U of T’s Department of Nutritional Sciences. However, there are many factors contributing to social isolation and loneliness when eating, such as mental illness, mobility issues, or poverty. In particular, vulnerable populations include those diagnosed with depression. Clinical depression is highly prevalent, affecting about 4.7 per cent of Canadians aged 15 and older. In fact, an alteration of eating habits is so symptomatic of depression that there is an association between depressive symptoms and emotional eating, whether in a loss of appetite or a spike in it. Another study found that social isolation when eating is a risk factor for depression. This is important as “it really becomes a little bit more reliant on the individual to recognize the need to maintain some sort of a social structure and to be able to initiate that. So as people become more and more isolated, the initiation becomes more and more challenging,” said Greenwood. Isolation and malnutrition is also apparent in older populations. In 2015, the Canadian Malnutrition Task Force found that 45 per cent of adults around 50 and older who were admitted to hospital were malnourished. Researchers have also found that social isolation and loneliness are two factors contributing to malnutrition in the elderly population. Food equates to energy in an athlete’s world. Sandakie Ekanayake crafts her diet so that she can balance her athletic endeavours as a lock for the Varsity Blues women’s rugby team and a member of the Pom Team. As most rugby games take place in the afternoon, Ekanayake’s main focus before a game is breakfast. Tea is a must in the morning for Ekanayake, game day or not, and is the beginning of her daily routine. Ekanayake says that her morning nutritional focus is on carbs, protein, and fats. She likes to begin the day with breakfast foods like eggs and bacon or sausages. As a commuter, Ekanayake’s quick on the go snack is peanut butter and jelly. The blend of protein and carbs is important to her diet. Following her mantra of balance, dinner the night before the game is just as important. Consuming carbs is key, so Ekanayake sticks to rice or pasta. Her biggest stress though is to stay hydrated. Staying hydrated is crucial for an athlete’s body, and so is getting protein before a game. Prior to the start of a game, she tries to consume simple carbs like a protein bar. Her eating habits aren’t too regimented, but she does her best to stay constant in season and off season by eating healthy year round. Like many of us, Ekanayake has a sweet tooth and her cheats are sweets. She believes it’s important to have a healthy relationship with food. Because of her increased training and field time, “the biggest thing [in season] is just eating more frequently and eating more food,” Ekanayake says. “It’s easy to lose energy when you’re doing that much work,” she adds. From lifts, to practice, and always being on the go, “Staying hydrated and staying fueled is not as easy as you would think… given the schedule of being a student athlete and you having other commitments on the side as well,” Ekanayake admits. One thing that can severely alter a diet is recovering from an injury. Ekanayake speaks to this as she recovers from a recent back injury. While she admits that it’s “easy to fall off the wagon here,” she says that she tries to avoid inflammatory foods as she recovers. Being adequately fueled, maintaining a healthy routine, and knowing which foods provide essential vitamins and protein is crucial to Ekanayake’s success not only on the field, but also in the classroom. U of T Kinesiology alum Leila Keshavjee’s startup has landed a sweet deal. 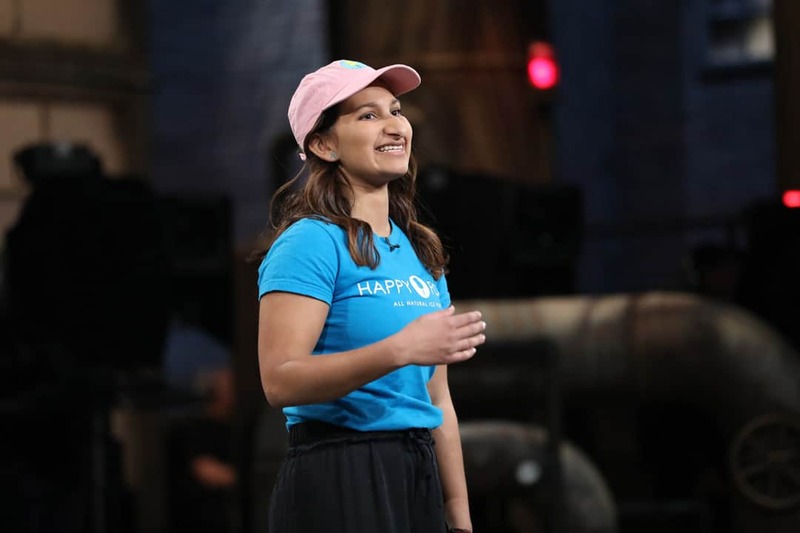 On the recently aired season 13 premiere of reality television show Dragons’ Den, Keshavjee’s healthy ice popsicle startup Happy Pops was offered a $150,000 investment and access to a business accelerator in exchange for 30 per cent equity. While still an undergraduate student at U of T, Keshavjee enrolled in IMC200 — Innovation and Entrepreneurship and IMC390 — Internship in New Venture, where she learned about what it takes to start a business. She started her ice pop business after graduating from U of T in 2016, when, with funding from her father, she purchased an ice pop business that had a 1,000-square-foot commercial kitchen but no retail products. “When I started, I made all the popsicles myself for the first month. So I used to cut the fruit, blend it all, put it in the popsicle mould, seal them, wash all the dishes and all that.” Now that the business has grown, Keshavjee’s role is primarily focused on sales and marketing. After being placed on the standby list, she was called and given three days’ notice to appear on Dragons’ Den. She had to prepare her presentation over that weekend, making sure it was entertaining and that the product looked perfect. Going into the den, Keshavjee was nervous. “I was nauseous, I was sleep-deprived, I was excited… I [had] watched this show for so long.” However, she relaxed when she saw that the investors liked her product. During her 45 minutes of filming, four of the six investors made offers for Happy Pops. Keshavjee made her final decision in about a minute. Originally seeking $50,000 for 10 per cent equity, she is finalizing an offer from Arlene Dickinson, whom she knew that she wanted to work with going in, of $150,000 for 30 per cent equity. Bugs: the food of the future? Would you like some crickets with your guac? It may not be long before you see six-legged creatures sharing menu real estate with beef and pork. With the global human population set to reach nine billion by 2050, experts say that conventional protein sources will soon be insufficient to feed everyone. Insects have been proposed by several groups as a protein alternative due to their high nutritional content and economic and environmental benefits. Over 2,000 insect species are edible; the most commonly consumed species include beetles, caterpillars, wasps, bees, and ants, followed by grasshoppers, locusts, and crickets. Insects are already frequently consumed and are considered a delicacy in 113 countries. In fact, chapulines, a type of grasshopper, are a national dish in Mexico. Nutritional composition is highly varied among insect species. Within a species, it depends on the stage of metamorphosis, the origin of the insect, and how the insect is prepared. Most edible insects meet the essential protein and energy requirements for human consumption, and they also contain beneficial vitamins, minerals, and fatty acids. The Nutrient Value Score (NVS) is a tool used to evaluate the nutritional content of food based on energy, protein, fat, and eight micronutrients. A 2016 study used NVS and found that palm weevil larvae and mealworms were significantly healthier than both beef and chicken. The study also revealed that the median iron content of crickets and honeybees were 180 and 850 per cent greater than beef, respectively. Eating insects may also benefit gut microbiome. Gut microbiota must consume prebiotics, a type of non-digestible fibre, to grow efficiently. The exoskeletons of insects are rich in prebiotic fibre, and they can even be crushed to a powder and added to salad dressings and shakes as a protein and fibre booster. The attraction of insects as an alternative protein source goes beyond just their nutritional benefits. Compared to conventional livestock, farming insects emits fewer greenhouse gases, requires less land, and causes less water pollution. Insects that are usually considered pests can be farmed for human consumption, which may reduce the use of pesticides for agriculture and alleviate the financial burden of pest control for farmers. There are even economic benefits: 70 per cent of livestock production costs involve producing feed for animals. Feed conversion efficiency is the measure of an animal’s ability to convert their feed mass into body mass. Insects tend to have higher feed conversion efficiencies than conventional meats. Another 2016 study found that the house cricket has twice the feed conversion efficiency of chickens, four times that of pigs, and 12 times that of cattle. However, the consumption of insects does not come without drawbacks. Some insects produce toxic compounds and contain heavy metals that can transfer to humans upon consumption. Many insects also have more sodium and saturated fat than conventional meats, which can increase the chance of coronary heart disease. The processing and storage methods for mass insect production are still being investigated. Despite these drawbacks, consuming insects may be the best alternative protein source in a rapidly growing world. Their high nutrient and protein content make insects an attractive option for regions with high food insecurity and malnourishment. As traditional meat sources face increasing environmental, social, and economic pressures, the choice to eat insects may soon become a necessity. In 1994, political satirist Christopher Buckley released Thank You for Smoking, a farcical account narrating the woes of tobacco industry lobbyist Nick Naylor that was later adapted into a critically acclaimed film. The twin works accomplished more than simple entertainment. They showcased the inner workings of ‘Big Tobacco’ and the manners in which private industries alter public perception of scientific research. Although we may imagine ourselves in 2017 to be better informed via the internet of possible corporate chicanery, there are still many ways in which private industries, like Naylor, “filter” the truth. However, all of this begs the question: why is private funding a concern? The empirical answer is that the source of a research study’s finances may very well bias its conclusions. In one paper, researchers discovered that out of 206 articles on the health effects of non-alcoholic beverages, an industry-backed paper was more than seven times more likely to have a favourable conclusion than a paper with no industry funding. Much like cigarettes in past decades, junk foods are one of the main comforting or relaxing vices we turn to. And, like their predecessor, there is a scientific consensus that junk foods are harmful to one’s health. Thus, as one might expect, the titans of the junk food industry have spent vast amounts of money funding nutritional research that they hope will either vindicate their products or discover some hitherto-unknown benefit to consumption in large quantities. A recent target is the US National Institutes of Health (NIH)’s Moderate Alcohol and Cardiovascular Health study. The study will measure a sample group’s cardiovascular health as they consume 15 g of alcohol once a day for 90 months. The results will be compared to a control group that has stayed sober for the same period. Although it is a publicly funded organization, the NIH was unable to obtain financial backing from the US Congress to carry out the study, forcing it to look for private backers. Unfortunately, this has led to the dubious arrangement of 67 million USD being provided by a cabal composed of companies Anheuser-Busch InBev, Diageo, Pernod Ricard, Heineken, and Carlsberg — all among the largest producers of alcoholic beverages in the world. Some private entities don’t stop at funding otherwise unaffiliated scientists. For organizations with the means and finances, it is not unheard of to create an entirely new corporate branch or private laboratory dedicated to the research of their choice. Frequently, these labs operate solely for the purposes of research and development of new products, such as Google’s Verily Life Science, which is currently developing smart contact lenses. Other times, scientists research the health benefits and shortfalls of already existing products. A prime example is Mars, Inc.’s Center for Cocoa Health Science, dedicated to unravelling the multifaceted mysteries of the cocoa bean, since its inception in 2012. Mars, Inc. has published studies in over 140 peer-reviewed academic journals since the early 1980s. In 2013, one paper analyzed industry and non-industry funded studies on the link between sugar-sweetened beverages and weight gain. They found that industry-funded papers were five times more likely to determine that there was no link. Furthermore, there is evidence that industry-backed research not only yields biased theoretical results, but it may distract from effective applications as well. A study found that randomized controlled trials proposed by researchers funded by private companies were less than half as likely than independent researchers to propose a change in diet as a method to combat obesity. But there are more links in the experiment-to-announcement chain than just the researchers themselves. Once conclusions are drawn and test tubes are put back in the cabinet, scholars must have their findings published in an academic journal to see their results applied beyond the laboratory. Of course, academic journals are also staffed and edited by humans who, like researchers, are then also potential recipients of a corporate payoff. Published in September in the British Medical Journal, a paper by five University Health Network scientists looked at the growing practice of private industries giving financial payments to academic journal editors. They scrutinized the payments made to 713 editors from 52 American medical journals. The main measure sought was the amount of money in USD received from private pharmaceutical and medical device manufacturers by each study participant in 2014. All participants were at least associate editors in the publishing hierarchy, and all journals were cited as influential. The authors divided the payments into two categories: research payments, which were for research related activities such as coordinating clinical trial enrolment, and general payments, which were for items more particular to the recipient such as meal or flight reimbursements. Due to their more ambiguous and personal nature, general payments were the focus of the paper. They discovered that while editors received a median general payment of $11, the mean general payment was a whopping $28,136. This massive right-skew to the data can be explained by the fact that editors in certain esoteric fields, such as endocrinology or cardiology, seemed to attract much more money. Evidently, there is a problem with privately funded research in academia. In her paper, Liu called for editors-in-chief of academic journals to consider the possibility of excluding industry-tied individuals from editorial positions. Once more, it seems that the answer lies in increased transparency. “We propose that a good place to start would be for all journals to have accessible, comprehensive, and transparent conflict of interest policies for editors,” said Liu. Intermittent fasting (IF) practices have been linked to beneficial health effects, such as increased insulin sensitivity and reduced body weight. A research team led by Dr. Kyoung-Han Kim at The Hospital for Sick Children and the University of Ottawa Heart Institute demonstrated that the effects of IF without caloric restriction include fat shedding and protection against metabolic dysfunction. The team hopes that the mechanism by which IF works can be studied to treat metabolic conditions such as obesity and type 2 diabetes. The effects of IF were tested on mice, which were subjected to a two-day unrestricted feeding period followed by one day of fasting. In the first six weeks, the IF mice demonstrated an improved metabolic state and a better ability to regulate blood sugar. After 16 weeks of the regime, the IF mice weighed less than the control mice who ate the same total volume of food. The researchers noticed that this weight loss corresponded to a loss of white adipose tissue (WAT) and increased thermogenesis, or heat production. WAT stores energy in the form of fat in your body. In the process of ‘browning,’ it can turn into brown adipose tissue, which is responsible for heat production from fat. Positive effects were seen in the mice following IF, including WAT browning, which have been linked to a protein called vascular endothelial growth factor (VEGF). It turns out that an IF-induced increase in VEGF triggers the ‘alternative activation’ of a group of cells called macrophages. This increases the level of M2 macrophages in the body, which then are involved in the browning process. According to the study, it is now accepted that thermogenesis by fat tissues improves metabolism and that VEGF plays a role in this process. Increased levels of VEGF in the WAT of IF mice amplified M2 macrophage activation and thermogenesis. Obese mice were then subjected to IF without caloric restriction and a high-fat diet, and they displayed similar results after six weeks. This included improved liver function and glucose homeostasis as well as WAT breakdown. These results suggest that IF can also be used to treat obesity, in addition to preventing it. The researchers also found that IF-induced increases in VEGF were reversible. During fasting, VEGF levels peaked, and during feeding, they decreased to their original concentrations. When they analyzed the activity of VEGF and M2 macrophages in human tissues, they found a similar correlation. It must be noted that comparing the effects of IF on mice and on humans is difficult. Periods of fasting lead to both mental and physiological stress, and humans have fundamental differences in baseline metabolic rates and required food intake. However, IF appears to improve both eating behaviour and mood in humans. The researchers have stated that further rigorous studies are required to examine whether the beneficial effects of IF last after the fasting has been discontinued, the potential harms that may be associated with IF, and whether IF is age- or disease-state dependent. Future studies aim to determine the precise response of human adipose tissues to IF and its association with circadian rhythm, gut microbiome changes, and sleep regulation. “We plan to investigate the effect of IF on human clinical setting. Based on the results seen from human trials of IF, this could be an alternative treatment method for human obesity and diabetes. However, human study will take some time to initiate,” said co-author Hoon-Ki Sung.